Ideally in this row, you'd want to play Alacrity for overall DPS. Agonizing Poison, however, can be a viable option for high levels of Tyrannical. You can swap to Deadly Poison for trash if you want to be efficient. Master Poisoner is currently the go-to talent of the row for raids. It raises the RNG of the spec quite a bit as it buffs your Poison bombs by a solid amount, especially if you're using Zoldyck's Family Training shackles. The buff to Leeching Poison is also very noticeable in certain cases where you might opt into that. Elaborate Planning is slightly behind Master Poisoner. Elaborate planning is the go-to talent in bleed focused specs and works well with either Exsanguinate or Alacrity. While specced into Elaborate Planning, you want to try and maximize it's uptime as much as possible, and during your Vendetta, you should always aim for 100% uptime, using less than 4cp finishers if need be. Hemorrhage has fallen off in the past few months by quite a bit compared to the other options in the row. It used to have a cool niche in cleaving multiple targets with bleeds, but is currently out of favor and should not be picked. Nightstalker buffs your Rupture and Envenom abilities when used through stealth. It's a pretty straight forward talent and is currently the best choice in the row, however, in certain cases its uses may vary. For example, if the boss or mob that you're required to burst down is about to die, you can opt to use its buff for Envenom instead of Rupture. With Mantle of the Master Assassin equipped and 4 piece, using Envenom instead of Rupture is preferable. Also, if you're using Zoldyck's Family Training Shackles, you can hold off on using Vanish until the boss reaches 30%, but only if you won't be getting another Vanish before the boss dies. Subterfuge is a buff that extends your stealth abilities by 3 seconds, thus allowing you to Garrote multiple targets which is excellent for M+. In raids, however, Subterfuge is slightly behind Nightstalker since 7.2 that fixed the extension of Mantle of the Master Assassin buff. Shadow Focus hasn't be used at all since the last expansion and there's currently no real reason to opt into this talent for the foreseeable future. Deeper Stratagem has fallen out of favour in Nighthold with the rise of cooldown reduction abilities. It's a simple numbers row and Deeper Stratagem currently doesn't cut it. Anticipation is also another poor choice currently. The talent hasn't seen any action this expansion and I don't see it being used in the foreseeable future. Vigor is your talent choice of the row. It has excellent synergy with your best legendary, Duskwalker's Footpads, and speeds up the spec quite a bit, even if there's still lots of downtime. Leeching Poison is excellent for encounters where you're taking heavy damage constantly and not in occasional spikes. I personally use this talent on Gul'dan mythic as we have a tactic where the rogues are sitting inside the well, soaking every soul thus taking continuous damage throughout phase 2. Elusiveness is another talent that shines in certain situations where you have to soak an ability that hits relatively hard and it wouldn't be possible to do so without the talent. I use this ability on Tichondrius to soak multiple stacks of Carrion Plague and keep it up 100% to help mitigate as much damage as possible. Cheat Death is your standard, go-to ability of the row. It allows for risky play while maximizing your dps and helps prevent the occasional feint use! Thuggee resets the cooldown of your Garrote and is your best bet in a rather underwhelming talent row. It has its uses in both raids and mythic+ and serves as a quality of life improvement when you have to swap on an add that dies relatively fast. Prey on the Weak increases the damage taken of a mob while stunned. It's naturally not usable on bosses and thus can only be viable if a certain add is present in a fight that has to die relatively fast. Internal Bleeding adds an extra bleed to a stunnable target. 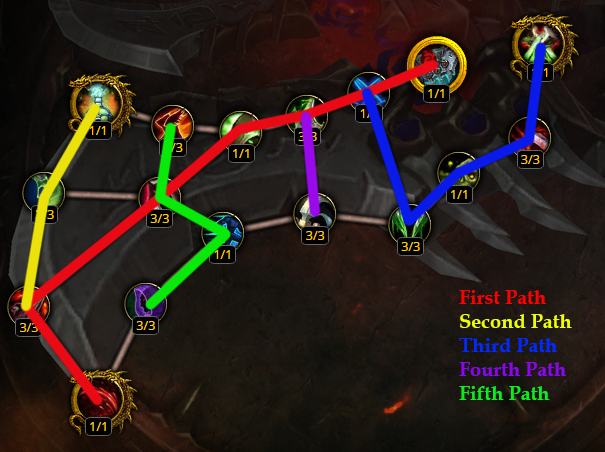 Agonizing Poison stacks up to 5 times and increases all the damage you're doing to a mob by a % tied to your Mastery. It's the spine of your build and should be taken in most, if not all cases during raids. 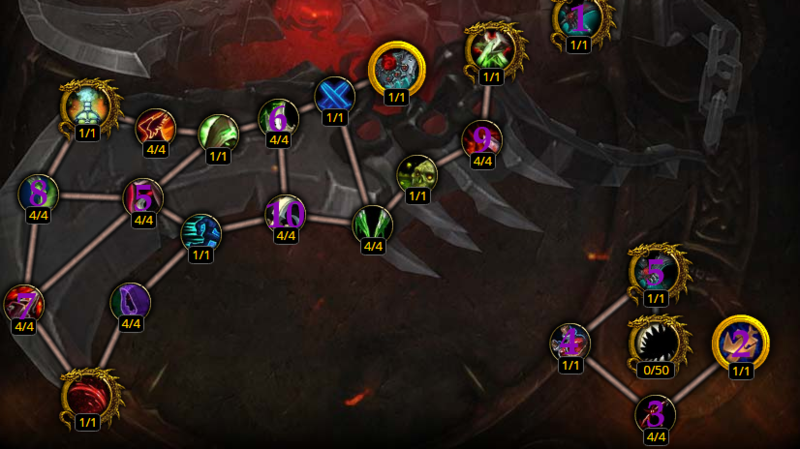 The Agonizing Poison has an extra modifier, Surge of Toxins that come through your Artifact weapon whose uptime you want to maximize as much as possible. If you're into a multi-dotting situation with this build, you should have agonizing stacks on any mob you have a Rupture ticking on to get the extra energy from Venomous Wounds. Using a mouseover Poisoned Knife macro can be very helpful. I have linked one under the macros section of this guide. Alacrity is a great alternative choice to the row if you opt into playing a more bleed focused spec, but is significantly behind in single target dps. It allows for extra flexibility when target swapping, and makes the spec significantly more care-free to play, as you don't have to be focused on your Agonizing stacks when swapping or on an fast Rupture with Exsanguinate. Exsanguinate for me falls as a third talent choice in the row. I feel like it has lost in niche and the 100% bleeds can't help in any situation other than bursting an add down in a relatively slow pace. Venom Rush doesn't have much competition in the row. It augments your energy regen and makes multi-dotting situations much smoother. Marked for Death isn't a talent that Assassination can make much use of it, if you opt to level as Assasination, it's a viable choice, otherwise not so much. Death from Above isn't as bad as it used to be with your Envenoms hitting much harder now, but it's still behind Venom Rush and shouldn't be used. A bit more on the cooldown reduction topic. The way CDR works in this game is that the more you have, the better it becomes. If you have 1 Master Assassin relic, then said relics value is below Toxic Blades, but once you equip Convergence of Fates, the value of said relic rises, just like getting a second Master Assassin relic would raise the value of the first one. This continues up until your Vendetta lines up with Kingsbane and at that point, the value of CDR drops quite a bit. On the Toxic Blades v Gushing Wound debate. Toxic Blades with Nighthold tier is head and shoulders ahead if you're able to sit on the boss constantly. There's certain fights, and certain phases of some fights, where you're unable to do so, such as Gul'dan phase two, and thus Gushing Wound pulls ahead, but it's very, very rare.